... and only a handful of heroes stand ready to heed her desperate cry for help. Enter the world of the Garou. The werewolves of myth and legend fight the corruption and decimation of Mother Earth. See them as you've never seen them before - their internal struggles, their secret challenges and their many rites and moots. 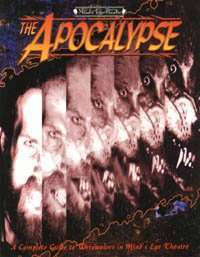 The Apocalypse not only expands on yhe already vibrant world of the Garou, it also expands the Mind's Eye Theatre system to encompass a host of new information, improving playability and inspiring creativity. This game is a must for Werewolf players and Mind's Eye Theatre enthusiasts alike.